Wish you could get out in nature more often but feel you don't have time to go on a week-long camping trip or an overnight excursion to a national forest? Think it's impossible to find nature paths and hiking trails close to home? Author Lucynda Koesters spent a year nature-trekking with her photographer husband Wil and six-year-old daughter Gracie — right in the vicinity of Louisville, Kentucky. They discovered an array of true hiking experiences close to home — old-growth forests, beautiful lakes and stream valleys, ridge-top bluffs and wildflower meadows — all in town or within a half-hour drive away. Take A Hike, Louisville! offers a family-friendly guide to over 30 natural areas and over 50 miles of walking paths and hiking trails that are perfect for a day or half-day outing for all ages. Each excursion highlights a specific trail or walking path and includes driving directions and detailed descriptions of venue amenities and nature features. Readers are encouraged to explore the diversity of opportunities offered in the different areas around Louisville. Wil Koester's dramatic black-and-white photographs compel readers to visit each scenic place. Whether you have an hour or a day to walk or trek, Take A Hike, Louisville! 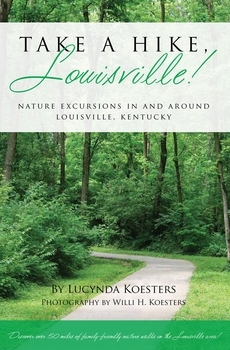 is a perfect guide to simple, convenient and low-cost nature excursions, right in the Louisville area.